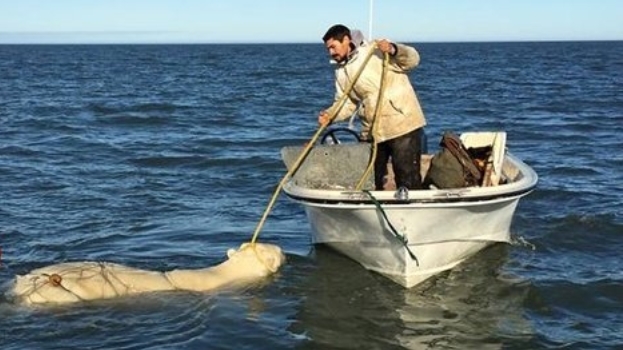 Rolan Warrior, an Inupiat guide from Kaktovik, was taking tourists to a barrier island to watch polar bears when he noticed one of the bruins caught in a net. “From rescue to conflict reduction efforts, Northern communities play an important role in the conservation of polar bears—they are on the ground 24/7 and have important experience and perspectives passed down from generations untold,” said Geoff York, Polar Bears International’s Senior Director of Conservation. 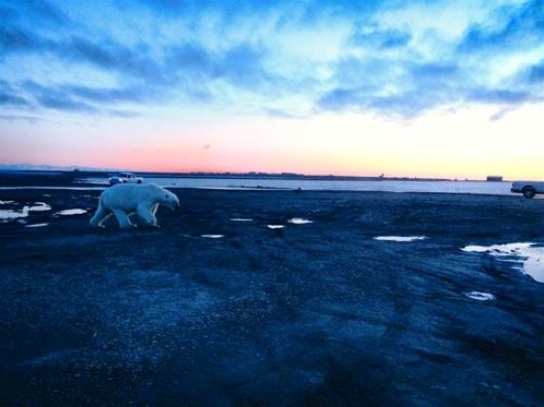 Kaktovik residents in boats kept the bear from drowning until the tranquilizers set in. They then maneuvered the bear to shore where the net could be removed. Biologists were able to untangle the bear, check for injuries, and release it. “It’s great to see local people and scientists come together to solve a clear problem. In this time of unprecedented change, we need more collaboration across the Arctic and across groups,” York said. Flora Rexford says, "My mother and my father went on their boat, and then the guide, Rolan Warrior, the guy whose net it was, they went out with their boats. They helped with rescuing the bear because they darted it but it went into the ocean so if the boats weren't there ... they were critical in helping save it. They got it to the shore - rolled it up on the beach - had a hard time getting it up on the beach in the waves and they got the net free." Responses to "Drowning Polar Bear Caught In Net Saved By Alaskan Inuit People"
Very brave to save such a fierce large animal. Bless you all for saving this beautiful bear. There are so few left now due to climate change, we need to save and protect them now so our future generation can see and enjoy their beauty. Thank you for your selfless actions! Just wonderful! Glad to see there is still some descent compassionate people out there. God bless you for saving the bear. With all of the greed motivating our government to drill, this is refreshing. Thank you so so so very much. Sweet bear...so lucky for your efforts. Thank you so much for saving this precious polar bear. Thank you for proving there are still good people out there! Nice, god bless you all. Kudos and blessings to the right minded people who saved this bear!! Their species is in grave danger and every one lost is heartbreaking. This is what Earth Stewardship looks like.May we all help our brothers and sisters of the wild. What a wonderful act of compassion and respect for the Earth. Thank you! These great news even made it to Germany :) Thank you so much! And please use your right to vote to finally stop Harper. Although Canada still has a good reputation in Europe (being eco-friendly, multi-cultural, peace-loving etc.) a LOT of people know what's really going on... Take action!! Standing ovation here for all of them! Restores my faith in humans to see/read this. Blessed Be! Good luck will accompany you for some time for that thankless act. Thank you, you did a very good job, thank you for the bear! The connection of native peoples and their animal brothers is a strong bond. What an great story with a happy and a fulfilling end. I so appreciate what the Inuit have done to keep their customs of respect for all life alive. A reminder that there are still some people with GREAT RESPECT FOR OUR WILDLIFE. ! If only others could learn from this. May the Great Spirit smile upon you and your people for saving a gift of Mother Nature. This action of responsibility is such a powerful example of how we all need to be in regards to our four legged family. I am honored to witness your kindness. This is why we are here sadly poeple have forgotten that. Beautiful people. Thank you so much! Thank you for saving this magnificent bear. Great Spirit will favor you with good fishing and blessings too!! PRICELESS! I wish all people were so giving and loving. The only thing to say is ............ Thank You for that bears life, each and every one is important. Wonderful to see the humanity! Thank you!! It's wonderful to see people go out of their way to help an animal that is suffering. Bless you all! Brother bear! We need to treat them this well all the time! AWE,,Thank You all for being Strong and fearless,you saved this Polar Bear and you are hero's to many of us that LOVE animals! Thanks for being brave and saving this scared and beautiful bear! Great people! Our wildlife has no voice. We have to be their voice. Bless those who saved him. Yes ! Good people to rescue a beautiful Nanuuq !! Having lived 8 years in the NWT, I never witnessed any Inuk show kindness or compassion to a wild animal. This incident must be a real first! Is there any way that salmon can be introduced to the Polar Bear? Let them come further south, just enough so as not to over heat, and compete with the brown bear. Of course the grizzly has a bigger attitude and may win out, but give the polar a chance. What a happy survival story. I am sorry to see so much of the ice melting there. Long may the Inuit Tribe thrive and long may the polar bears live and thrive. Prayers to them. thank you for saving the bear. Animal and human lives are equally important in the great creator's eyes. Thank you to the rescuers of that very tired polar bear. Wonderful. No puede ser que estos pobres animales tengan que estar sufriendo estas cosas en su propio habitat natural es totalmente perverso y totalmente injusto que ellos contribuyan para que nuestra vida sea mejor mas hermosa y nosotros les hagamos la vida imposible no solo para que pasen hambre por no poder cazar sus propios alimentos gracias al desastre que estamos generando si no asta el punto de no poder caminar o nadar es el colmo es total mente perverso. a human being with a hart for animals, I love this!